Story: Calvin is a six-year-old kid living with his parents and his best friend the tiger Hobbes. In his world, the barrier between reality and fantasy is fluid, making him having to deal with monsters, especially under the bed, bullies at school and yucky food. Fortunately Calvin is the proud owner of a transmogrifier, which will turn him into anything, and a time machine which will take him anywhere in space and time. Calvin has two great alter egos: Spaceman Spiff, the space faring adventurer, and Stupendous Man, the superhero who can solve all his problems. Of these, Spaceman Spiff is the most dominant, especially in Miss Wormwood's classes. Background notes: Calvin is named for a sixteenth-century theologian who believed in predestination. 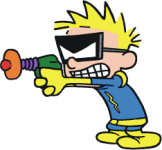 Most people have assumed that Calvin is based on Bill Watterson's son or childhood memories. According to himself, that is not the case. Unlike most highly successful series, Calvin and Hobbes was stopped while it was successful. The final strip was published Dec. 31, 1995 and new material has not been published contrary to the whishes of many fans. According to Watterson he felt unable to keep the quality of his work and rather than letting the quality slide he stopped the series. Most successful comic strips will be turned into cartoons, merchandise, games etc., but Watterson has refused to let Calvin and Hobbes be used for anything outside the comic strip. The characters can be found as screen savers, animations etc. on the Internet, but no merchandise.